Don’t lose your way. Define your North Star. When we talk about your North Star, we’re referring to a single point of focus that guides you and your company, and stops you drifting off course. Finding Product Market Fit, moving to a Growth Stage and Scaling-up is not easy. There are systems, processes, and tactics that are proven to make this easier, growth faster and more sustainable. It’s our job to deliver these to you. This is why ZOKRI exists. Your North Star Metric is related to your North Star but this time is the metric that guides your business above all others. What you choose as your North Star Metric will depend on your growth stage and product, and can change through time. The number of OKR and Initiative Check-ins. 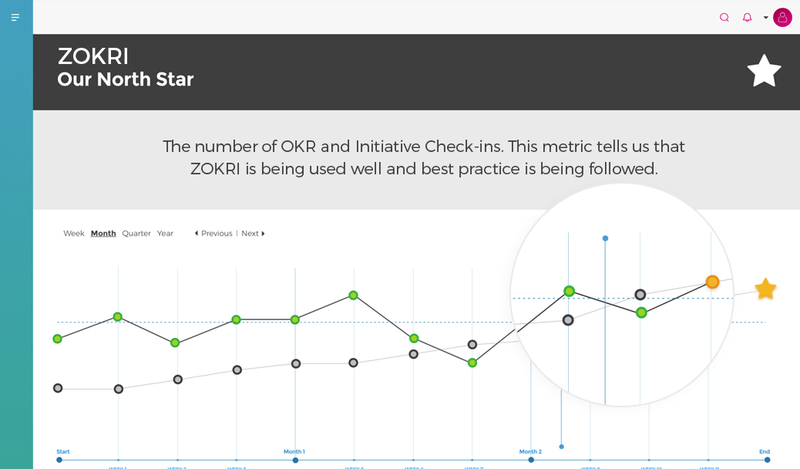 This metric tells us that ZOKRI is being used well and best practice is being followed.